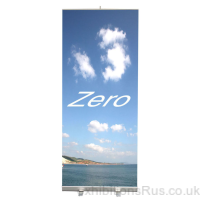 Banner stands, pull up banners, pop up banner stands what ever you call them by, here you have a wide choice of mechanical retractable roller banner systems. All promotional display graphics in these systems are supported by tensioned bar or pole system. 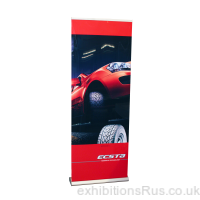 Banner stand graphics are displayed by means of a header and kicker rail locking into the pole and the body of the banner stand base unit. 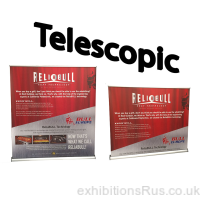 Choose from our range of quick and easily assembled portable roller banner stands, all supplied with instruction sheets, widths range from 600mm up too 3200mm depending on the model chosen. Some of our units are offered with double sided graphic display ability (twin rollers) Digitally printed, high resolution graphics, dependant on your supplied file, with brilliant colour reproduction, printed with 100 year inks. All these units come with a protective carry bag. Some of these systems can have new graphics printed, fitted to a cassette, or the body of the pull up banner can be returned to ourselves, some can easily be changed by yourself, please call 01256 768178 for more information and costs. Standard dispatch time is 4 days or less by request. 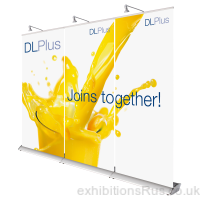 We print our pull ups to stoplight media so as to stop any backlit issues from other exhibition stand or windows. We can also print to Pvc banner for mass runs on a tight budget or a system that could be used at an outdoor event. All these units come with a protective carry bag. 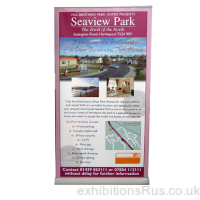 We have spent many years checking our banner stands and only offer reliable quality systems.